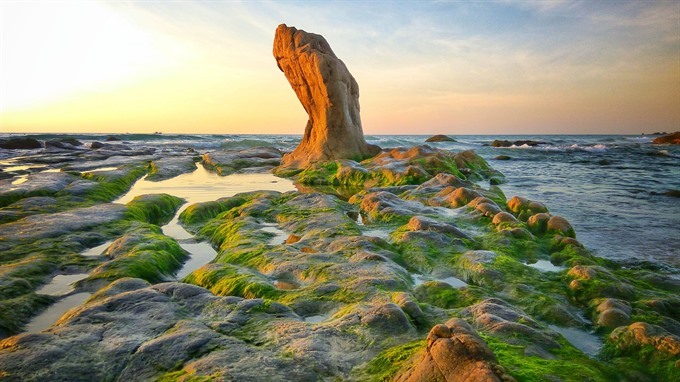 When travelling to the south-central coastal province of Bình Thuận, tourists often head for the well-known resorts, beaches and sand dunes in the Mũi Né area of Phan Thiết City. 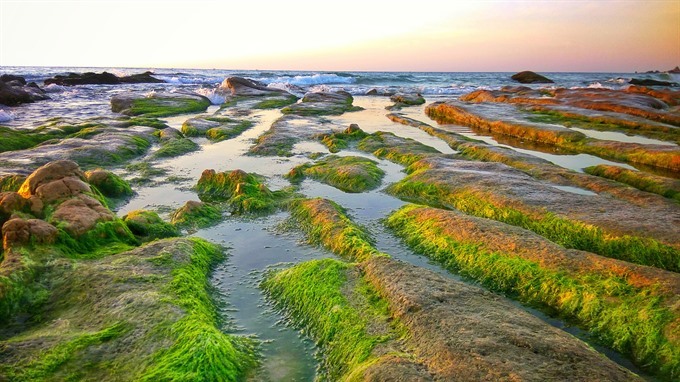 But only 100 kilometres away is Cổ Thạch beach in the province’s Tuy Phong District, an unusual coastal site lined with seaweed-covered pebbles and rocks of varying shapes and sizes. In recent years, the area has seen thousands of people, mostly photographers, coming to visit between February and April to capture images of the rocks at sunrise and sunset. When the tide recedes, the green seaweed on the stones and rocks glistens in the morning sunlight and appears blue, but at noon it takes on a yellow hue. The stunning changes in colour can also be seen at sunset. For me, Cổ Thạch beach and Chùa Hang (Cave Pagoda) nearby are part of my childhood memories with many caves nearby to discover. On holidays, especially during Tết (Lunar New Year festival), locals would visit the beach to relax after a year of hard work and study. Today, the beach, which is about one kilometre long and 200 to 300 metres wide, is as beautiful as ever. With a dizzying variety of small and big stones, I can still climb up to the top of a rocky boulder and sit and enjoy the sound of waves crashing onto the shore. As children, we were fascinated with the stones and rocks that had been pushed to the shore for thousands of years. We would pick up the small oddly-shaped stones, some with a heart shape, and take them home with us after each trip. Many of the small stones appear in a variety of colours. Some look turquoise or yellow, and others purple, white, pink or red under the sunlight and morning dew. The stone shapes are dependent on the strength of the sea waves and the flow of water. Every year, shortly after Tết, our parents would take us to Chùa Hang Pagoda by motorbike to pray for happiness and to have a picnic. It was an easy trip as our home was only 14 kilometres away in Tuy Phong District’s Phan Rí Cửa Town. Built between 1835 and 1836 on a low hill 64 metres above sea level, the pagoda was recognised as a national historic site by the Ministry of Culture and Information in 1993. Reflective: Stones and rocks covered with moss shimmer under the sun. — VNS Photo Dương Đức. The pagoda was first built by Zen Master Bảo Tạng in the mid-19th century. Over the last 176 years, the structure was expanded, and there are now shrines that can be seen inside many caves located on the pagoda’s grounds. 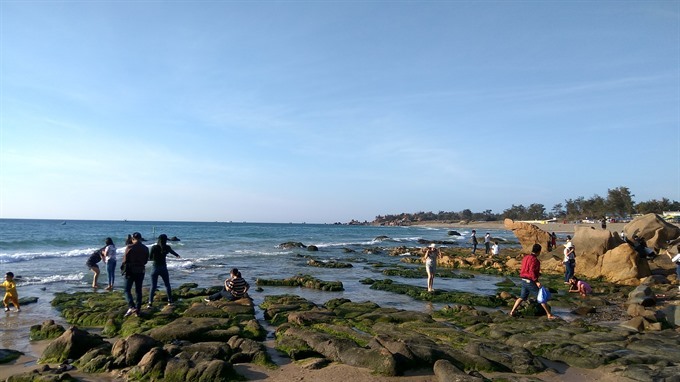 In 2011, the Việt Nam Guinness Book Centre officially recognised the beach as one of the most colourful in the country because of its thousands of stones and rocks. Many of the stones from the beach are used by artisans in the area in their works, which are the pride of Tuy Phong District residents. Like other beaches in Bình Thuận Province, the beach’s water is clear and deep blue. 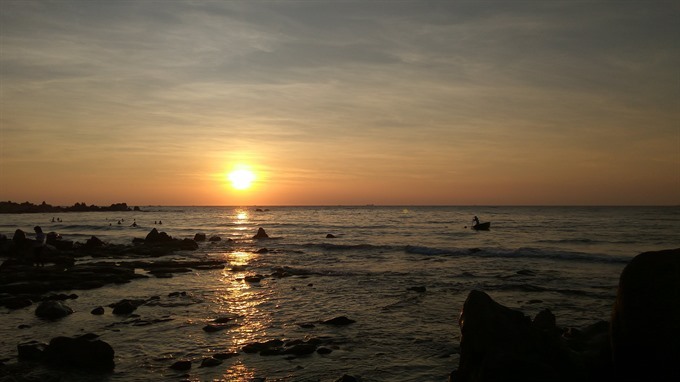 Besides the small stones, the beach is surrounded by giant rocks of different sizes and shapes that resemble an elephant or an old woman with a hunchback, some of which have legends associated with them. At the beach, many tourists like to eat fresh seafood like crab, scallop and grilled or boiled fish at food stalls located near the beach or on the way to the beach and pagoda. To get to the beach from HCM City, you can travel by bus for around seven hours to Tuy Phong and then hire a motorbike driver. They can either hire a tent for VNĐ50,000 to camp on the beach or stay at inexpensive hotels for no more than US$5 a night. If you drive on your own from HCM City, it will take longer, about eight or nine hours, but you will be able to see the sea and sand dunes the entire way. From HCM City, drive to Phan Thiết City and then travel along the province’s Mũi Né beach until you reach Phan Rí Cửa Town in Tuy Phong. Cổ Thạch beach is about 14 km away. To attract more local and foreign tourists to the area, provincial authorities have invested in new roads that extend from HCM City to the beach and the pagoda.